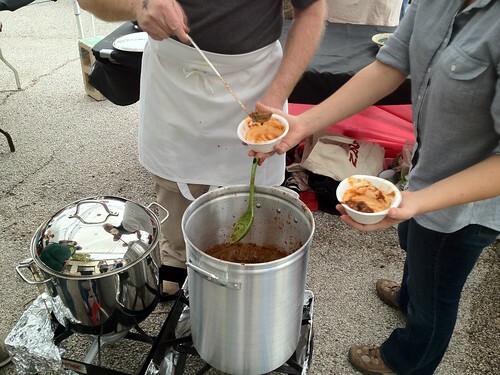 24th Annual Lone Star Vegetarian Chili Cook-Off! | bake me away! 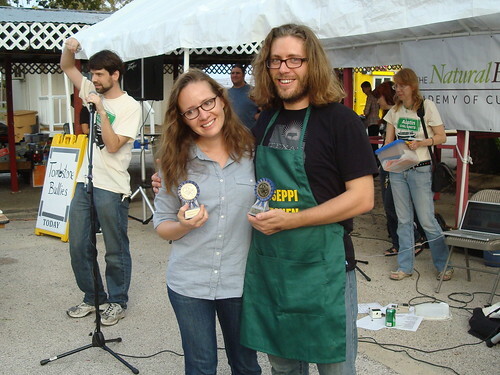 24th Annual Lone Star Vegetarian Chili Cook-Off! 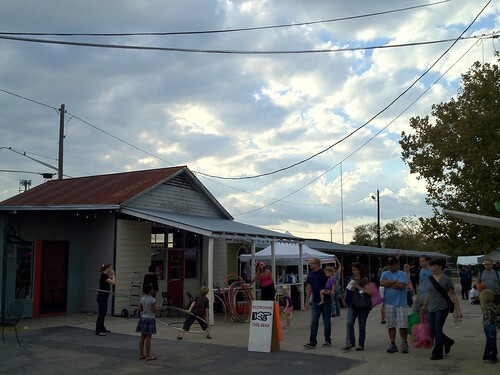 Today in Austin, the 24th Annual Lone Star Vegetarian Chili Cook-Off took place at the Burnet Road Farmers Market. If you’re from Texas, you may wonder what exactly goes into vegetarian chili when so many people here swear by one chili rule: NO BEANS. Well, this native Texan thinks that’s silly. Teams could enter into either category of chili: “Traditional” – chili made with a meat substitute (seitan, tempeh, etc. ), or “All Veg” – chili made only of vegetables. This year there were nine Traditional and thirteen All Veg teams competing. Some were from restaurants and culinary schools! 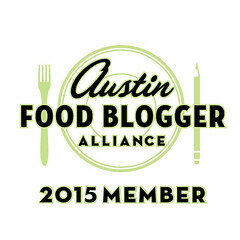 I found out about this event through the Austin Food Bloggers Alliance because they wanted to have a team represent the group this year. Taylor Cook and James Seppi of Coseppi Kitchen (see what they did there?) volunteered to be that team. They are new to the group and have a great vegetarian blog! 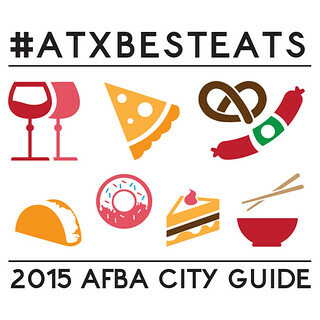 When I got there, I found the AFBA booth and tried their chili first. Taylor said that it had lentils, black beans, and eggplant in it and that had they used dried chiles to season it as opposed to powdered spices. Man, it was so good! Hearty, smoky, and not too spicy…it was perfect, I thought. They offered fresh cilantro as a topping which only added to the deliciousness. I say this with all honesty: none of the other chili samples I tried after that could compare! There was a great variety though, which was nice. The least traditional was a Thai curry chili, and I was pleased that one of the teams went the Frito pie route. I came back to the booth to help with stirring and serving, which was quite fun. So many people were stoked to find out about the eggplant in the chili (myself included), and a lot of folks came back for seconds saying that it was their favorite chili! At the end of the event, it was time to announce the awards from the judges and attendees. Guess what? Taylor and James won 1st prize for the All Veg category AND the People’s Choice Award by a landslide! Way to represent AFBA, Coseppi Kitchen! And you know what else? They just posted the recipe on their blog! I can’t wait to make this chili. Congrats to the other winners as well, including Red Hot Vegans for 1st prize in the Traditional category and the Best Booth Award! Even though they had their own team, they’re AFBA members as well. It’s a good group to be a part of in this town! How fun! I love delicious chili, though to be honest I have no idea why you’d keep meat out of it. Oh, you crazy vegetarians. Also, I didn’t realize beans were a no-no in Texas…I love beans in my chili (not a euphemism)! I really like the sound of the Thai curry chili too…delicious! Thanks for the great write-up and for your help yesterday! I had so much fun at the chili cook-off too! When we were judging all of the chilies came in anonomous containers, with no toppings or extras, & I had no idea who was who but there was one that had fresh cilantro on top and I totally guessed it was the afba team. Ha! I think I always forget about the no bean rule. Most of the chili I had growing up was made by my mom, though, and she doesn’t count as full-Texan. Mary – I’ve always loved beans in my chili, even when I ate meat. And yeah, the Thai curry chili was so good! Just not very chili-like. James Taylor (this is what I want to call you guys) – Thanks for letting me help, and also for posting the recipe! Lazy Smurf – ha! Typical food bloggers are typical. :) I saw you looking all official! Judging must have been a fun experience. 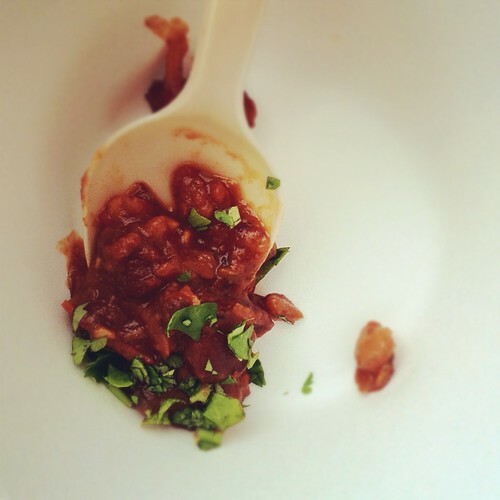 Pingback: 25th Annual Lone Star Veggie Chili Championship | bake me away! 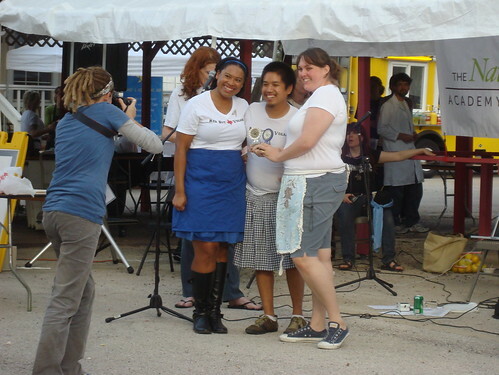 Pingback: 25th Annual Lone Star Veggie Championship | bake me away!